Scientists recently announced the discovery of a mother octopus that guarded her eggs for 53 months, or 4.5 years. The amazing thing is during that time, it appears as if she didn’t even eat. According to researchers, the deep sea octopus mom has set a record for the longest time an animal has guarded its eggs. They noted that 4.5 years of brooding is around three times as long as other species. “This is the longest brooding or gestation of any animal on the planet,” said Brad Seibel, animal physiologist at the University of Rhode Island. During the entire 4.5 years, the mother Graneledone boreopacifica octopus does not appear to eat at all. Instead, she stays by her eggs, protecting them against any underwater predators that might want to eat them. According to researchers at the Monterey Bay Aquarium Research Institute, they were able to first observe the deep sea octopus in 2007 by using a remotely operated vehicle (ROV). 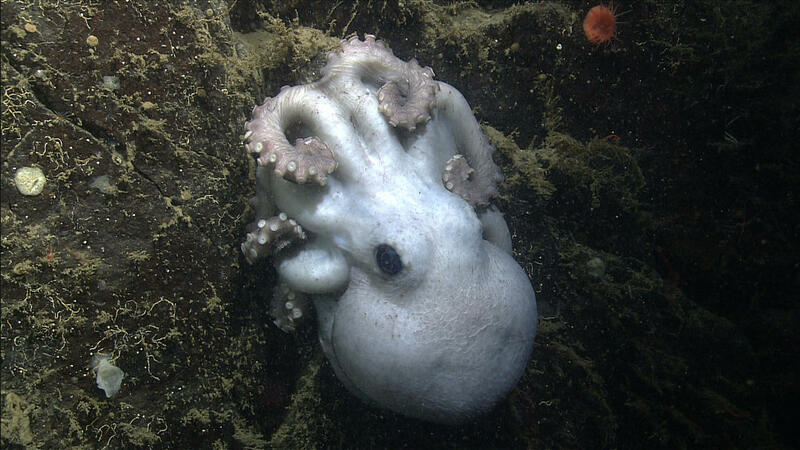 They spotted the octopus in an ocean canyon off of California around 4,600 feet below the surface. They noticed she had just laid a batch of eggs. Over the years, the team frequently checked up on the mother octopus, studying her habits and her eggs. The researchers last checked up on the octopus in October of 2011. They saw that the animal was gone, and the 150 eggs had hatched. They published their study in PLOS One. A video of the mother octopus guarding her eggs can be seen below. And people think it’s a good idea to eat them alive? Who are the savages on this planet? it seems most people can’t get and regurgitate enuff propaganda and sympathy for the (nazi/jew story), yet most eagerly support and participate in the far more brutal, far more systemic, far more impactful use and abuse of our mammal brothers/sisters, let alone other species. Sounds delicious, especially the eggs. That is one dedicated mother.